blockchain and augmented reality into a world building simulation. Worldopoly is a real-time multi-player strategy game that implements blockchain and augmented reality into a world building simulation. it provides an economic incentive as well compelling gameplay through the implementation of its own cryptocurrency WPT. Below are the 3 outstanding characteristics that makes Worldopoly unique in mobile gaming. • The player can buy real streets in real cities (underlying technology: Google Maps/openstreetmaps). • Worldopoly is the first mobile game that implements blockchain technology in compelling gameplay, therefore, creating an insightful understanding of blockchain. • Augmented reality makes it possible to actually “see” one’s in-game progress. • With the introduction of the WPT there is real money to be made playing the game. • With the possibility to trade every in-game item for WPT the player can earn cryptocurrency without investing real money. This is a great way to introduce players to the world of cryptocurrencies without the financial risk. Combining AR, Blockchain and Geopositioning Worldopoly provides a unique gameplay experience that enhances mobile gaming from its current limitations. While other games focus on either AR or world building, blockchain or gameplay. Worldopoly purposefully integrates all technologies into one. Every implemented feature has its unique purpose. With AR you experience the game in real life, Blockchain provides an advanced level of security and Geopositioning brings the cities of the world onto your device. Once the construction is complete the building starts to generate income and a new interface becomes accessible. • Customization items. Like automatic income collectors, fire extinguishers etc. • Generation additional income for the player by „walking” on his streets. • Collecting coins from other players who haven’t managed to collect them on time. • Damaging – other players buildings using purchased vandalism items (e.g. Molotov Cocktails, Hired Gangsters, Bug-Infections etc.) using the VR-Extension. • Raiding – other players by using the the AR-Extension and connecting with other „raid-partners“. • Trading with other players using the market place. • Joining Clans in order to interact and finance big expensive projects together. • Build political movements, influencing the economic situation of Worldopoly’s universe. All items can be purchased for a set price in order to boost player interaction the number of items is limited for each duration. Items – all items have certain effects on the buildings they are used for. Items can be activated in the building interface under the point “items” which opens the inventory. The auction – can be used to buy from as well as sale items, buildings or streets to other players. The seller defines a minimum price and the other players can bet on the items. Unique Items can be purchased only for WPT tokens. Selling – Everything can be sold by putting it up for an auction and setting a minimum price. Monitoring sales – all sales can be monitored. Coins – Base currency, collectable within the game and to be used to purchase everything from the shop. Building resource – Premium currency purchasable either by WPT or real currency. WPT – ERC20 standard tokens with limited emission, freely convertible either in game or real life currency (outside the game) which will be offered during the ICO. Allows players use advanced game functions. In the shop currency can only be bought. In the Marketplace every currency can be exchanged for another, the price is set by the players. Co-founder and CEO of PepperMint Talents, an established, Munich based recruiting company that introduced innovative new ways in finding the best talents on the market. Previous functions include strategic consulting and campaign management in numerous political campaigns in Austria and Germany as well as being the founder and CEO for 3 years of a consulting company specialized in market entry consulting between the DACH-region and eastern Europe. Founder & CEO of dotcom Ventures Holding AG, established in Kanton Obwalden, Switzerland. Dotcom Ventures Holding AG invests in innovative IT Start-Ups, mainly in mobile projects. After studying law in Cologne, Germany, he completed his MBA in Barcelona in 2009. He is also the co-founder of Lindenvalley GmbH and app-agentur.com. Founder and CEO of Lindenvalley GmbH - one of the biggest privately held app development agencies in Germany. Felix has successfully set up a wide range of start-ups and high load projects for big DAX corporations and is highly experienced in software development and management of large software development teams. Also, he is the co-founder and co-investor of the Swiss company dotcom Ventures Holding AG where he invests, together with a large network of family offices, in high-potential IT start-ups. Maria puts her heart into every business she works for. Specialist in writing press releases and working with the media. Maria knows the importance of staying connected with people from all areas of life and works closely with investors, advisors, developers, journalists. With a commitment to the mission and core values of the company, she looks towards a world that is positively changed through blockchain technology. Charles has over 15 years of international client relationship and Information technology experience. During this time, he has also fostered successful working relationships with a network of decision makers and influencers across various industries. UI / UX designer with more than 10 years graphics and animation working experience. Engaged in designing, building interfaces, usability, emphasis and style. Constantly improving and studying new technologies such Illustrator, Sketch, Affinity, Animate, Invision, Principle and Flinto. Certified specialist with 17 years experience in developing and supporting more than 50 medium to large scale web projects: spanning e-commerce, unique commercial solutions, social networks with the most advanced technology for infrastructure functioning, databases, data flow and processing in real time. Scrum Alliance Certified ScrumMaster. Great experience in conducting and implementing innovations within the company, identifying and solving strategic problems in the team. Highly qualified specialist with 15 years of experience in the field of Frontend and Backend development. Most of the time, Oleg develops complex user interfaces, the logic of their interaction and integration with third-party services. For his many years of experience, he created many web applications, participated in the development of large CRM systems and managed the development of business projects. Artem is a passionate strategist and global visioner. As a solutions-oriented, Business Development Manager with proven experience in B2B and B2C markets, he has been developing and implementing complex marketing & technical solutions within ICT industry for the last years. During this time, he has also established relationships with a network of decision makers & influencers across Europe and the United States. As an entrepreneur driven by a passion for startups and innovation, Katya has manifested her expertise in each of the projects she had been involved. She has spent the last 15 years in and around early stage companies, building startups and high-growth businesses in various fields. Her Master’s degree in Computer Science and Applied Mathematics, with major in Economics, allows Katya to effectively apply both her business experience and technical knowledge while strongly focusing on communication and collaboration with clients. Nikita is an experienced Data Scientist and a Computer Vision & Deep Learning Engineer. He acquired his experience in Machine Learning while working at innovative startups and established software development companies. Nikita is the Lead developer of Computer Vision System at the largest video on demand and TV service in Eastern Europe with over 20 million users. He has a BSc in Applied Mathematics, certified by Washington University, Jonh Hopkins University and Moscow Institute of Physics and Technology. The game engine and the server part of the app are developed. The game interface is created. 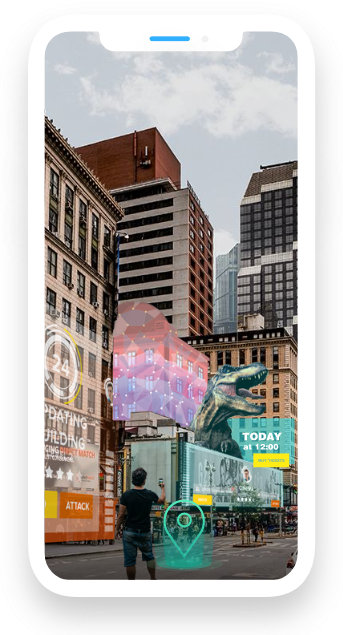 Elements of augmented reality are integrated. as well as place their own advertising. new methods of interaction between players, as well as unique objects. and also help them to understand game better). Personalization for end users and advertisers. and new types of facilities for urban improvement. adding the feature of creating your own currency within the city.